The Precision Rifle’s factory buttstock, pistol grip, fore-end and safety selector switch can all be reconfigured using compatible AR-15-style components—opening the gun up to virtually unlimited customization options. Offered at this time in three short-action chamberings, the rifle is available in .308. Win. with a 20" barrel, 6.5 mm Creedmoor with a 24" barrel and .243 Win. with a 26" barrel. The weights vary by chambering, but with the lightest model starting at 9.7 lbs. sans optic, the Precision Rifle is not a light firearm. 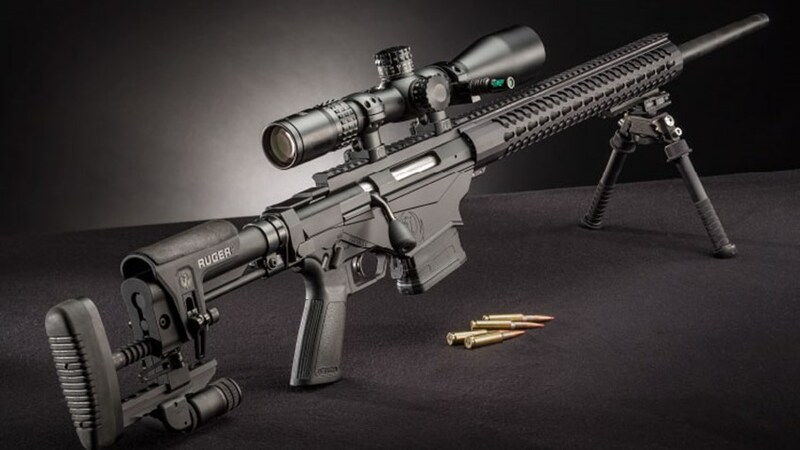 The evaluation gun provided by Ruger was chambered in 6.5 mm Creedmoor and—after being furnished with a scope, bipod and stock-mounted monopod—tipped the scales at just over 15 lbs. Development of the Precision Rifle started with the stated goal of sub-m.o.a. 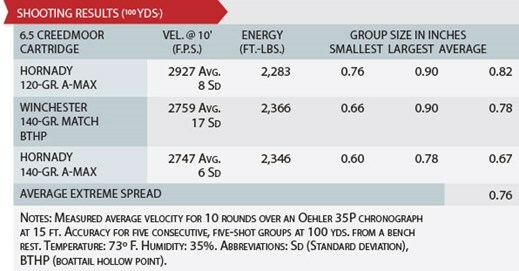 accuracy using American Rifleman’s protocol of averaging five consecutive, five-shot groups. The end product managed to exceed that goal by a fair margin, as internal testing conducted by Ruger has yielded an average of 0.83" at 100 yds using multiple guns. The sample sent to American Rifleman for testing performed even better than that, achieving an average result of 0.76" at the same distance using three ammunition loads. The rifle’s buttstock (above left) can be locked in the folded position, allowing the bolt to be removed from the receiver. The patented Multi-Magazine Interface (above middle) allows the gun to feed from both rear- and side-latching box magazines, and the barrels are given a recessed crown and are threaded at the muzzle (above right) to facilitate the use of compensators or suppressors. All Precision Rifle barrels are medium-contour (0.75" at the muzzle) and are free-floated within their fore-ends. Twist rates were selected by Ruger to ensure the rifles could stabilize the longer bullets within each chambering that are most popular with long-range shooters. The barrels are threaded at the muzzle (5/8x24 thread pattern) to facilitate the use of compensators or suppressors, and come with a thread protector. A 20-m.o.a. canted Picatinny rail is secured to the top of the receiver by four screws, allowing for increased long-range elevation adjustments with the gun. The rifle’s buttstock, a proprietary Ruger design that the company calls the Precision MSR, allows for up to 3½" of adjustment to the length of pull and 3/4" of comb height customization. Both can be accomplished quickly in the field by flipping two cam levers on the side of the stock to the unlocked position, adjusting the stock to the desired settings and then tightening the levers down again. Although the process is a little more complicated, the cant of the buttpad can also be adjusted up to 9 degrees in either direction. The gun’s standard configuration also includes an extended-reach AR-style pistol grip, 15" free-floating Samson Keymod Evolution fore-end and a reversible, 45-degree safety selector. If any of the rifle’s default furniture is ripe for replacement, in my opinion it’s the fore-end which—when affixed to a substantially heavy rifle like the Ruger Precision—takes on an overly aggressive texture. Like the Precision Rifle itself, the 6.5 mm Creedmoor cartridge and chamber were developed from the start with accuracy in mind. With a freebore diameter specified at 0.2645" and bullets measuring 0.2640", the projectiles are forced to enter the rifling with minimal in-bore yaw. The Creedmoor also produces plenty of energy (most loads hover right around 2,400 ft.-lbs. at the muzzle)—and thanks to a relatively high ballistic coefficient, will retain that energy at extended distances—yet recoils minimally enough through a gun with the Precision Rifle’s heft as to allow for all-day shooting sessions with absolutely no discomfort. During the course of the event, we exclusively used Hornady’s 140-gr. A-MAX offering, and the guns seemed to agree with that load quite well. Unfortunately, in many areas of the country it can be difficult to find adequate space to truly indulge in the sport of long-range precision shooting. The open spaces needed to really stretch a cartridge’s legs simply aren’t available to many shooters, so a lot of these folks resign themselves to the next-best alternative open to them—benchrest shooting at 100 yds. And while the Precision Rifle was made for long-distance use, it can still punch paper at closer ranges with the best of them. The first zeroed-in, five-shot, 100-yd. group I fired through the gun at FTW measured a tidy 0.51", and as you can see from the tabulated results, the rifle is capable of keeping groups under an inch all day long—though, as might be expected given the twist rate, it does seem to favor heavier bullets.